Networking: Why Is It So Important? Believe everyone who tells you that networking in college is incredibly important. Networking and having connections are responsible for a lot of job or internship opportunities that students have and will encounter. Those connections help you find out about opportunities relating to your major/field, and can introduce you to some very important people. 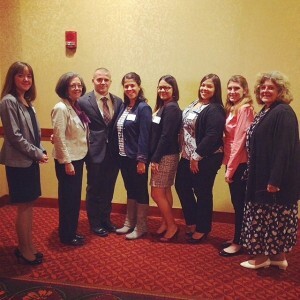 This photo was taken at the PRSA Digital Media Summit in Mid-October. Present are three Communications professors along with a group of students from the Communications department, including myself. This was an amazing networking opportunity! There are many ways to develop connections and build your “network.” Being part of clubs, honors societies, associations, organizations, etc. are great ways to do so. Your network can include fellow classmates, professors, professionals, and even friends. A good connection is someone who has something of value to you, whether it’s a classmate who worked incredibly well with you on a project that got a great grade, or an old internship supervisor who can write a letter of recommendation for your hard work while interning for their company or organization. These people can help you put your foot in the door, and you can do the same for them as well! I recommend building your network of connections early on in your academic career. Create lasting relationships with people whom you have enjoyed working with or for. They are the people who can vouch for you that you are great at what you do. Good luck!